I honestly think that I have a love hate relationship with salmon. Sometimes I crave for it, other times I had how it tastes like plain. Today was one of the rare days that I actually miss cooking and eating salmon, so I whipped up whatever it is that I can find from my fridge for breakfast. Check out my super simple recipe under the cut. Cheers! Preheat the oven to 175 degrees Celsius. 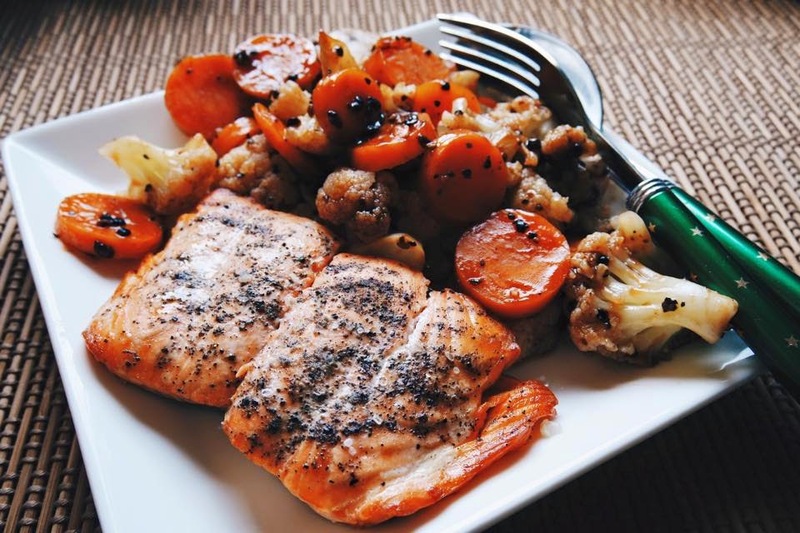 Season salmon with salt and coarse grained black pepper. Place salmon, skin side down, on a non-stick baking sheet or in a non-stick pan. Bake until salmon is cooked through, about 12 to 15 minutes. Roughly chop the cauliflower, carrots and button mushrooms. Place into electric steamer and steam for about 7 to 10 minutes. Add all veges into a bowl, pour in black pepper seasoning and mix well. If you're not a huge fan of black pepper like I am, then simply substitute the flavoring.. or eat them veges plain!